One question that seems to pop up repeatedly in comment threads on the recent de facto removal of the Register of Copyrights is to ask how why the position is called the Register of Copyrights, and why the Copyright Office remained in the Library. In this post I’ll offer some thoughts on the question, and give some history of how the US Copyright Office remained part of the Library of Congress in the waning days of the nineteenth century. In the same Congress, a freshman (and ultimately one-term) Congressman from rural Missouri, William Treloar, introduced his own comprehensive bill to reform copyright (PDF, 4 MB – bill text and hearing).4 Treloar was a composer and music publisher, whose advertisements trumpeted his compositions selling a million copies.5 I’ve written about the Treloar Bill in the past, in the context of the creation of performance rights for music, but what’s of interest here are the provisions for the administration of copyright in the United States. In particular, the Treloar Bill provided for a “Commissioner of Copyrights,” appointed by the President with the advice and consent of the Senate, with the powers one would expect of an executive appointment. At a hearing on the bill these provisions were popular with copyright stakeholders, but the Treloar Bill foundered on its provisions that would have extended the manufacturing clause. In the end, despite the popularity of the idea of separating the copyright function from the Library of Congress, Congress was uneasy with the Constitutional implications of allowing the President to appoint, with Senate consent, a legislative officer under the supervision of the Joint Committee on the Library, as the copyright statutes stipulated. The confusion as to whether a Register of Copyrights even could be an executive appointment lead Congress to remove any mentions of a Register of Copyrights in the omnibus funding bill that would include funds for the relocation of the Library to its new building. However, at the last minute and with minimal debate, the Senate provided for a Register of Copyrights to be appointed by the Librarian. Without any real further comment from Congress, that has been the state of affairs ever since. As for the name of the position “Register of Copyrights,” a keen reader may notice I don’t have a firm answer. However, looking at the debates and hearings at the time, the title “Register” seems to have been the functional term for the position which Ainsworth Spofford used to identify the function of being in charge of copyrights, in contrast to the title of “Registrar,” which Spofford felt he held de facto, but not officially. Representative QUIGG. You made a report to one or the other branch of Congress advising that the copyright business be separated from the business of the library? Mr. SPOFFORD. Yes; connected with the Library of Congress, but in charge ot a separate responsible and competent officer, who might be called the registrar of copyrights. Representative QUIGG. Did you recommend that there be any connection between the copyright business and the Library as such? I’ve posted about the oral argument heard before the Supreme Court in the Star Athletica case, and the Supreme Court has since posted the audio of the argument. 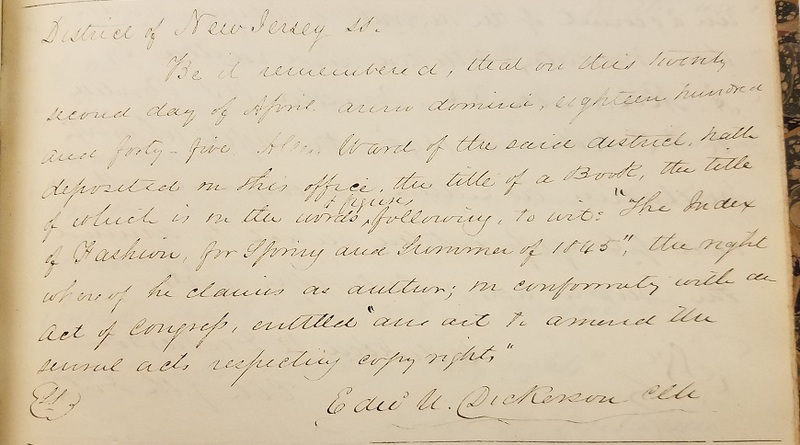 Apropos of that, I wanted to share something I found in the 1790-1845 Copyright Record Book for New Jersey. Before 1870, the individual District Courts registered copyrights on behalf of residents of their respective Districts. Most of the records made it to Washington, DC when copyright was centralized there in 1870, but a fair number did not. The records for before 1845 in New Jersey were considered lost for decades until Joseph Felcone transcribed them. The original that he used to create his transcription is now in the National Archives Regional Division in New York City, and I digitized that volume today as part of a larger project that I’ll be talking about much more in the coming weeks and months. With recent events, new focus has been put upon the relationship between the US Copyright Office and the Library of Congress. I think it’s worth exploring a bit of how things got this way. In this post, I’ll explicate a bit on how copyright ended up in the Library of Congress, and in a subsequent post I’ll explore how the Copyright Office became its own entity. I’ve already posted a bit about the early interactions between the Library of Copyright and nascent Copyright Office, and I hope to post more about that as well. As most people who dabble in copyright know, copyright in America has generally consisted of three parts: Notice, Registration, and Deposit. The notice is generally an act taken by the author or his/her assignee (generally the publisher)to provide notice of copyright – in the very beginning this actually required publishing a notice in a newspaper, but mostly all that has been required is placing a copyright notice on the work. Registration is of course the act of registering the work for copyright with the statutorily-designated register. Deposit is the act of depositing one or more copies pursuant to the statute. However, the Smithsonian Institution was never particularly happy with being a depository for copyright books, and in 1859, with the acquiescence of the Librarian of Congress, Congress shifted the venue for copyright deposit to the Patent Office. And even as these changes for copyright deposit ensued, copyright registration had steadfastly remained with the local district courts. In 1862 a bill was introduced in the House of Representatives to move copyright registration to the Patent Office and divest the District Courts of their registration duties. In response, a group of publishers sent a memorial (PDF, 1MB) to Congress, protesting any such change. The bill never gained any traction, although it is possible there were simply higher priorities in Congress in 1862. In 1865, the newly-appointed Librarian of Congress, Ainsworth Spofford, was able to insert language into the law adding photographs to copyright law revitalizing the requirement of deposit of copyrighted works with the Library of Congress.3 The new librarian vigilantly lobbied to increase the role of the Librarian of Congress, and when a friend of Spofford’s was appointed the new commissioner of Patents in 1869, the resistance to Spofford’s efforts faded away.4 In 1870 the only omnibus revision of intellectual property law in American history was passed, and one of its changes was the transfer of all copyright registration and deposit activities to the Library of Congress. One of the pleasures of living in DC is the ability to semi-randomly saunter over to oral arguments of interest being held at the US Supreme Court, and I did so on Monday in the “cheerleader case” of Star Athletica v. Varsity Brands. The case concerned a suit by the market leader in cheerleader uniforms (Varsity) against a comparatively recent competitor that offered identical uniforms to those created by Varsity’s custom uniform tool on its website. The District Court granted summary judgment to Star, holding that the cheerleader uniforms were useful articles and thus not eligible for copyright protection. The Circuit Court reversed, and the Supreme Court granted certiorari. It was hoped that the Supreme Court would offer guidance as to which of the multitude of tests for determining whether a work is a useful article was appropriate, but the transcript of Monday’s argument shows that the question of which test is appropriate never really came up. The members of the Court were engaged with the discussion throughout, but their focus was more on the broader questions raised by granting copyright protection to garments for the lengthy term copyright offers. Of course, the Star Athletica case is the first time the Supreme Court has addressed the useful articles doctrine since its 1954 decision in Mazer v. Stein, which held a sculpture that was primarily used as a lamp base copyrightable. The Mazer decision is a staple of law school classes on copyright, but up until now it was assumed that no transcript of the oral argument had survived. The Supreme Court began audio recording oral arguments in October of 1955, and transcripts of cases before that date are rare, and are generally focused on constitutional cases.1 However, the transcript (PDF, 7 MB) of oral argument from Mazer v. Stein was recently unearthed, and it is a fascinating document. It shows a Court wrestling with some of the same concerns of duration that the Court wrestled with yesterday, as well as engaging in substantial discussion of the relationship of copyright law to design patents. The argument in Mazer also featured testimony directly from the Copyright Office, including substantial discussion of historical practices of the copyright office regarding the registration of artwork. 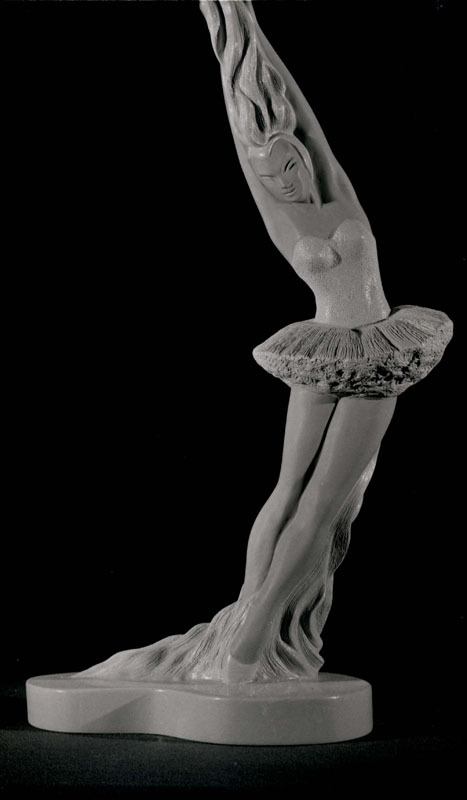 There was also a lengthy demonstration and discussion of the “curved ballet dancer” figurine (shown below), one of the six statutes/lamp bases at issue in that case, discussing how it was made. Also of some interest is the trial transcript from the Mazer case (PDF, 3 MB), which in addition to discussion of some of the same issues that came before the Supreme Court, includes some fascinating background on the case, including reference to the Commercial Supply Co. of Chicago funding the defense of the case. One thing that tends to confuse folks about older cases is the changing nature of the Federal Circuit Courts – until 1891 they were trial courts that operated in tandem with the District Courts, staffed by District Court Judges as well as US Supreme Court Justices “riding circuit.”1 The National Archives has the files of the old Circuit Courts in their holdings, mostly in their regional branches, and I’ve become familiar with the Circuit Court records because pretty much every trial-level case on intellectual property in the nineteenth century was brought in the Circuit Court. The only Circuit Court records held in the DC location of the National Archives on Pennsylvania Avenue are for the DC Court, and the Archives was recently good enough to share three inventories made in the 1990s of these records. All are searchable PDFs under 2 MB. The first of these inventories is a general inventory of interesting cases, which includes mentions of a case involving the cost of printing the Congressional Globe, a patent case, and a great deal else. The second is perhaps the most interesting to scholars, and it is also the longest at 80 pages. It is an inventory of all DC Circuit Court actions involving african-americans during the antebellum era. The picture that emerges is a depiction of the banality of slavery in society over sixty years. Listed in this file are many petitions for freedom, and these petitions are available online. Finally, there is an inventory of household items seized by marshalls. It’s worth remembering that every case mentioned in these inventories corresponds to a folder at the National Archives in Washington DC. After eighty years of copyright registration being handled by the Federal District Court for the region of the state the author or publisher lived in, copyright was centralized in the Library of Congress in July of 1870.2 For 27 years, Librarian of Congress Ainsworth Spofford was in charge of copyright registration in the United States. However, perhaps inevitably, Spofford’s administration of copyright was somewhat disorganized, as his main interest in copyright was ensuring that the Library of Congress received deposits of all books and other library materials registered for copyright.3 It was obvious that a head of copyright for the United States was needed, and in 1897 the position of Register of Copyrights was created by Congressional Act. Spofford had just stepped down from the position of Librarian of Congress after 32 years, and the Library moved into its first dedicated building, now the Jefferson Building, that same year. With the library entering the modern era Thorvald Solberg was appointed the first Register of Copyrights. However, in 1898 Spofford’s succesor died in his second year in office, and the hunt for a new librarian began. Solberg feared that the next Librarian would be a political appointee, and took it upon himself to engineer the appointment of a Librarian who would be nonpartisan. This story has been rarely told, but Solberg left a handwritten account entitled “The Librarian of Congress and the Register of Copyrights” (PDF, 15 MB) in his personal papers, now held in the Manuscript Division of the Library of Congress.4 The full account is worth reading, but briefly Solberg convinced the President to delay making an appointment and convened a conference of librarians from around the country.5 This conference put forward the name of Herbert Putnam as the best choice for the next Librarian of Congress, and Putnam duly became the Librarian of Congress in 1899. Solberg and Putnam would continue in their respective positions for decades, until Solberg retired at the age of 78 in 1930.6 Putnam would serve another decade beyond that as Librarian of Congress. It is impossible to ask them anymore, but it is difficult to imagine that Solberg could have been Putnam’s subordinate in any meaningful sense once Solberg had engineered Putnam’s appointment. Over time, the Copyright Office developed into an independent agency inside the Library of Congress – oral histories done by the Library of Congress confirm that by the 1970s employees of the Copyright Office generally considered the Office’s connection to the Library tenuous at most. The Register of Copyrights engineered the appointment of a new Librarian of Congress 117 years ago as of this post, after which time the Copyright Office has been largely left to its own devices. It will be interesting to see what the future holds. One little-remarked aspect of the current presidential election is that Hillary Clinton may be the first IP lawyer to be elected President of the United States. This aspect of her biography isn’t generally discussed, but sources indicate that her practice during her 18 years at the Rose Law Firm in Arkansas was focused on intellectual property law. This is borne out in the reported cases where Secretary Clinton served as counsel. Of the five cases where she is listed as counsel of record in the written decision, three concern trademark law (the other two are contract disputes). Interestingly, trademark law is the only major area of intellectual property not discussed in her Initiative on Technology & Innovation. Discussion of the three cases follows after the jump. What’s a new blog without a Hello world! post, no? Over the past few years I’ve had more and more things I wanted to share that didn’t fit into the right format for either a social media posting or a full law review type piece. My goal here is to have a forum for sharing this stuff with the world. Generally expect a lot of interesting archival material regarding intellectual property law, and various sundry other things I find interesting. Author Zvi S. RosenPosted on July 22, 2016 October 21, 2016 Categories UncategorizedLeave a comment on Hello world!